Bring style and storage to your bedside with this nightstand from the Rustic Lodge collection. Crafted from hardwood solids and veneers, this nightstand offers striking style with its blend of rustic and contemporary sensibilities. 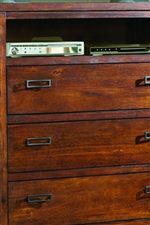 Two spacious drawers where remote controls, reading glasses, and other bedside necessities can be stored are accented with raised rectangular hardware. A metal straight-leg base lends the nightstand an industrial feel, while the Acacia finish of the wood welcomes rustic warmth to the piece. With its no-fuss design and purpose possibilities, this two-drawer nightstand is sure to make a most welcome addition accompanying your bed. 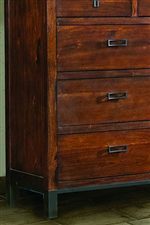 The Rustic Lodge Two-Drawer Contemporary Nightstand with Straight Leg Metal Base by Vaughan Furniture at AHFA in the area. Product availability may vary. Contact us for the most current availability on this product. Finish An Acacia finish provides the pieces in this collection with their warm rustic appeal. Handles & Hardware Raised pierced rectangular hardware is showcased on drawer fronts throughout the collection. Case Detail Straight-leg metal bases seen throughout the collection provide storage units with an industrial flair. This collection, otherwise, showcases a streamlined fuss-free design. Case Construction This collection is constructed from hardwood solids and veneers. Celebrate the comfort of a cabin retreat or luxury lodge while in the warmth of your very own home with Rustic Lodge. This collection of bedroom essentials, crafted from hardwood solids and veneers, offers an eye-catching blend of rustic and contemporary styles that are sure to make a most intriguing environment in your master suite. This fresh interpretation of frontier living combines masculine and feminine styling and celebrates artful design details, such as visually appealing pierced geometric hardware and the industrial influence found in straight-leg metal bases. A plethora of storage drawers offer must-have organization, while the fuss-free design of the overall collection lends that modern appeal you've been searching for. Satisfy your taste for eye-catching style and storage galore with the Rustic Lodge collection. The Rustic Lodge collection is a great option if you are looking for Contemporary furniture in the area. Browse other items in the Rustic Lodge collection from AHFA in the area.